The sources said following a meeting held at Richard Morgan Tsvangirai House (formerly Harvest House) on Saturday, MDC leaders were divided over Chamisa's planned visit to Manicaland, with others expressing concern over his safety. "There was debate on whether doing so (visit) now would take focus away from helping people because a good size of our structures will then focus on the president's visit. Chamisa was, however, keen on that, but his technical team asked him to wait while they assess the feasibility of the visit," the source said. "He told his security that he was not a coward and would not hide in Harare, while people suffered, insisting that as a leader he had to be at the front," the source said. As the MDC heads for congress in May, party insiders said if Chamisa had listened to the advice of his team his chances of retaining the presidency would have been "washed away" in the aftermath of the storm. Against the advice of his technical team and security, Chamisa mobilised aid through other lawyers, party structures and partners before teaming up with Mwonzora, Komichi and another vice-president Elias Mudzuri to head to Manicaland province on Monday morning. Chamisa's spokesperson Nkululeko Sibanda could neither confirm nor deny the debate surrounding Chamisa's visit. He only said: "President Chamisa has a team that gives him advice, he is not a one man band. He, however, has the power to override advice he receives." 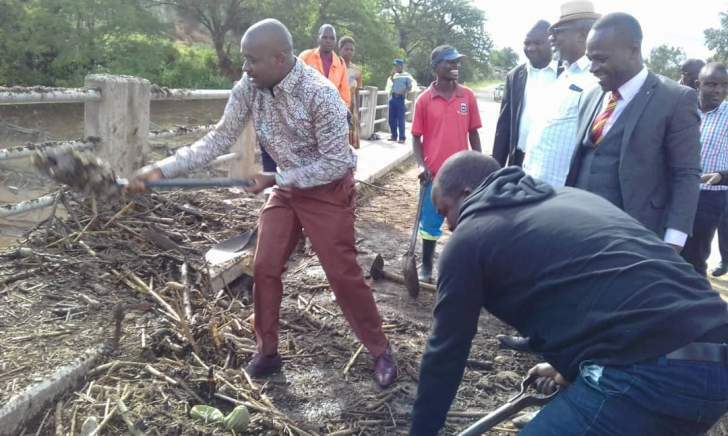 Chamisa's tour in Manicaland ignited a social media debate with some accusing him of using the disaster for political mileage and photo opportunities, while his supporters commended him for providing leadership.